5つ星のうち5.0"Tele" is a magnum opus by Pjusk!!! "Tele" is the 3rd album by Pjusk, a Norwegian ambient project featuring Jostein Dahl Gjelsvik and Rune Sagevik. 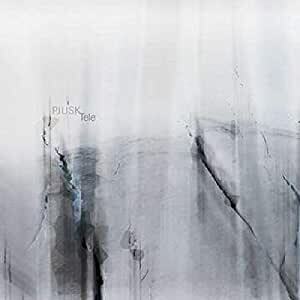 While Pjusk's first two albums came out on US label 12k, their newest work was released during March 2012 on Italian label Glacial Movements, the connoisseurs of arctic dronescapes. Gorgeous images on the digipak look really impressive (executed by Erika Tirén and Noah M/Keep Adding), so let's explore the sonic visions of these Norwegians. Shorter intro "Fnugg" dives strightly into mysteriously subterranean worlds, where remains also the next composition "Gneis", assembled with shadowy soundscapes and occasionally invading heavy weight drones, all precisely interacting with distant metallic rumblings and deeply cavernous organic sounds and covered by haze and eeriness. Absolutely awesome journey!!! "Flint" moves into strange glitchy terrains, with more experimental, oddly colored structure, but towards the end reaching slightly more relieving aura, announcing the next escapade entitled "Skifer". Floating in subterranean territories and hauntingly enriched by cascading intense, nearly cinematic passages and rather slower, hypnotic groovy pulses. "Skifer" is another, truly fascinating sonic revelation evoking spectacular images of immense northern landscapes and presenting Pjusk at its most distinctive soundscaping, loaded with pure adventure and virtuosity!!! Misty groovy heartbeats can be explored also through "Krystall", but this time heading into celestial realms, painted with angelic choir-like washes, assorted sonic disruptions and polished languid rhythms. More minimal and tranquil, but beautifully mesmerizing and evocative!!! "Granitt" delves into more active terrains, dominated by mid-tempo rhythms, enriched by factory-like noises and carefully integrated with organic and cinematic soundscapes. Hugely stirring and immersing!!! "Kram" sinks into deep cavern with more relieving and meditative mood, attractively colored with secretly shimmering sound injections. Shorter "Bre" remains safely in these shadowy zones, while the closing composition "Polar" is invaded by the monstrously frightening flood of heavy drones, the grand finale is here!!! Soon the high-tech metallic grooves steal the journey and icy panoramic sceneries are permeated by warmly mesmerizing and elatedly uplifting images. Wow, these Norwegian guys are phenomenal!!! Not to forget, additional guest list include Andreas Nordenstam (mastering and album arrangements, co-composer and co-producer of "Fnugg"), Frodebeats (modular sound design, co-composer and co-producer of "Flint"), Tor Anders Voldsund (guitar treatments) and Joe Scarffe (glacial sound effects). No questions here, "Tele" is not only another groundbreaker by Pjusk, magnificently illustrating unique, dramatic and one of the earth's most scenic winter environments, but also another highly sophisticated sonic pearl in the growing Glacial Movements catalogue!!! To me, "Tele" is a magnum opus by Pjusk!! !